Mountain Cove - San Gabriel Valley - A diverse community living with nature. by the San Gabriel Mountains National Monument and the San Gabriel River. Mountain Cove is beautiful, but what makes this community truly special are the people that live here. The residents of Mountain Cove make this community what it is. Our neighbors are more than just neighbors...they are friends. We especially appreciate it when our neighbors get involved in the community in which they live. We have several community events throughout the year. Living in a natural cove of the foothills provides a vibrant community connection. In this niche, carved out by time and careful hand, Mountain Cove cradles a way of life: rustic, refined, a private habitat of natural tranquility. Nature has created a special space amid the majesty of the San Gabriel Mountains National Monument (aka: the Angeles National Forest). Mountain Cove's three collections are woven into a handsomely textured tapestry of community life. Paths within the neighborhoods connect one to another, linking you to friends and private recreation. A panoramic overlook takes you to the top of the community to enjoy a stunning view. The trails offer the natural refreshment of biking or hiking. 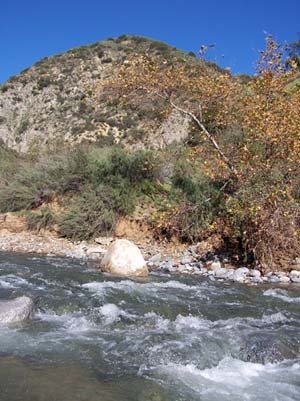 And around the perimeter of Mountain Cove, the San Gabriel River winds through nature as it has for centuries. 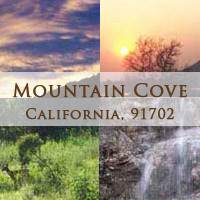 Like Nature herself, everything about Mountain Cove reveals a sense of balance, charm and enrichment. Being such a special place to live, it can be difficult to purchase a home here. Neighbors frequently get letters from realtors telling us that they have a specific buyer wanting to pay top dollar for our homes. The problem is, most of us love it here and don't want to leave. It is one of those very rare gems in the San Gabriel Valley that cannot be duplicated. Copperwoods (3,233-3,691 sq. ft.) Spanish, Cottage, Craftsman architecture. Sagewoods (2,648-3,178 sq. ft.) Spanish, Traditional, Craftsman architecture. Wildwoods (2,160-2,580 sq. ft.) Spanish, Traditional, Craftsman Bungalow architecture. A total of 9 floor plans and 3 elevations for each floor plan with each having a variety of colors, bricks, and stone. Each development offered a different set of amenities. All homes are well built. The Sagewoods have higher basic standards that Wildwoods. The Copperwoods have higher basic standards than both Sagewoods and Wildwoods. It is also common for Mountain Cove homeowners to add many upgrades to their homes. This private gated community is surrounded by the Angeles National Forest (wildlife), the San Gabriel River (water birds), and has Robert's (Seasonal) Creek running through it. It has its own community park, community Woods Lodge, pool, Jacuzzi, trails and community events. During seasons with very heavy rain, we usually get natural waterfalls along the canyon walls of the Cove. It is a wonderful thing to see. The San Gabriel River Bike Trail begins at Mountain Cove and goes all the way down to the Pacific Ocean.